Included in the 4.2 release is a new browser extension that now supports Firefox, along with Chrome. Importing has been simplified to a single button click that when activated, uploads the web page, resources, and a screenshot to Visallo. After installing the extension from the Firefox or Chrome store, simply navigate to your Visallo installation and log in. The extension will automatically detect (Requires Visallo 4.2) and configure that instance. The extension can handle any number of Visallo instances, just visit them once to add them to the list. Importing a page is as simple as opening the Importer from the toolbar and clicking Import. Optionally choose which Case and Work Product to add the page to. Choosing a product displays interactive previews to assist in selecting the appropriate product. Make as high-fidelity import to Visallo as possible. Import what the user sees at the time of import, not how page looked when initially loaded. Leverage the user’s authentication. Don’t require Visallo to have access to the page. Allow users to view a copy of the webpage, as it existed at the time of import, from Visallo. To accomplish these goals we bundle all page content, styles, and media (images, audio, video) into a single multipart-html file. 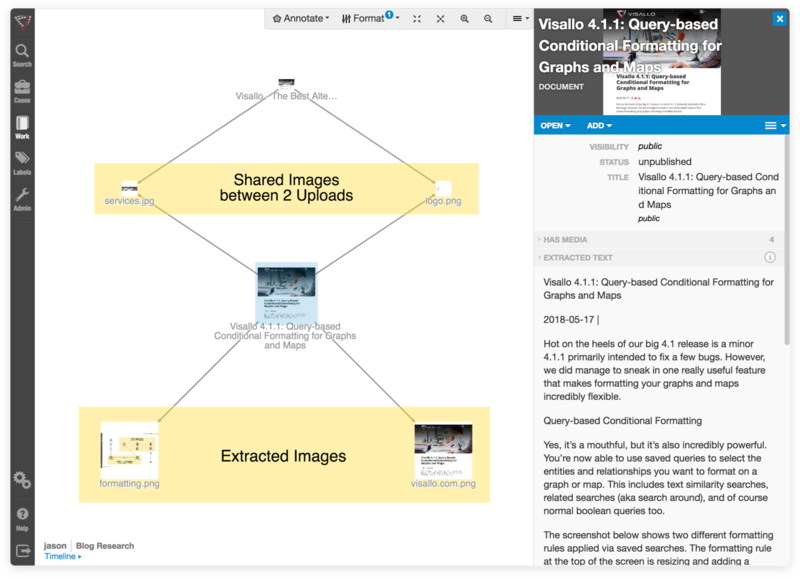 This format includes everything necessary to view the page, which users can do within Visallo using the Open Original* menu option. Along with the MHTML, the extension generates a screenshot of the page for a preview in the Element Inspector. After uploading, Visallo extracts media from the multipart documents and links them to the original document. Identical resources are not duplicated. Instead, new relationships are created. We think you’re going to love using the new Visallo Importer to collect a wide variety of resources at the click of a button. Want to see it in action? Request a demo today!